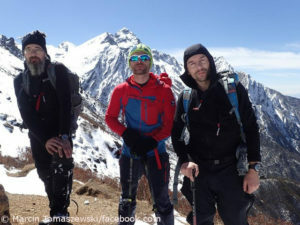 For about a week the two Russians Dmitry Golovchenko and Sergey Nilov have been fighting their way through the East Face of the 7,710 meter high Jannu in eastern Nepal. The wall has never been completely climbed so far. 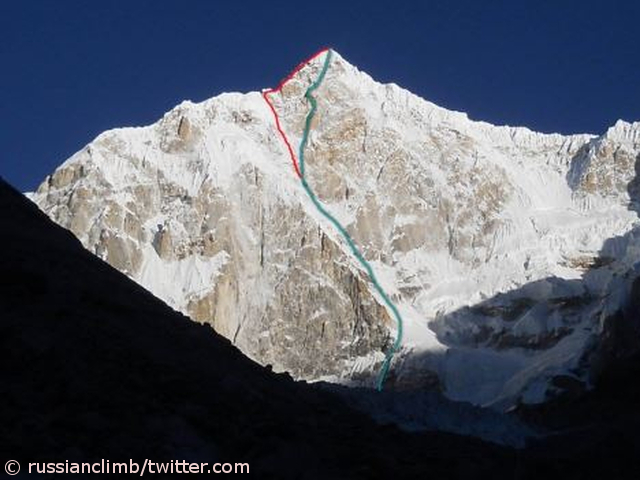 In the past three days, the two climbers have made little progress due to bad weather. According to information from the Internet portal “Russian Climb“, they are stuck at an altitude of more than 7,000 meters at a spot below the Southeast ridge: “Options: to continue climbing via the French route or to go down. It’s still snowing. Visibility is poor.” The first ascenders of Jannu, the French Rene Desmaison, Paul Keller and Robert Paragot as well as the Nepalese Gyalzen Mitchung Sherpa, had reached the summit via the Southeast Ridge in April 1962. Golovchenko and Nilov have given up their original plan to climb the East Face completely up to the summit. On Wednesday the snowfall is expected to ease, for Thursday better weather is expected, but only for a short time. Actually, Marcin Tomaszewski had wanted to enter the wall with the two Russians. But the Polish climber did not because he didn’t feel sufficiently acclimatized. “The key difficulties of the climb on Jannu are between 6,800m and the summit”, Marcin wrote on Facebook. “Too dangerous”, if you’re not acclimatized enough, said Tomaszewski. The 2,000-meter-high Jannu East Face has already been tackled several times in vain, at the latest at 7,100 meters was the end of the line – also for the Slovenian top climber Tomaz Humar (1969 – 2009), who failed in a solo attempt in 2004. Golovchenko and Nilov are known in the scene. They have already been awarded twice the Piolet d’Or, the “Oscar of mountaineers”: in 2013 for their first ascent of the Northeast Spur of the 7,283-meter-high Muztagh Tower in the Karakoram (with Alexander Lange) and in 2017 for their direttissima through the North Face of the 6904-metre-high Thalay Sagar in the Indian Himalayas (with Dmitry Grigoriev). 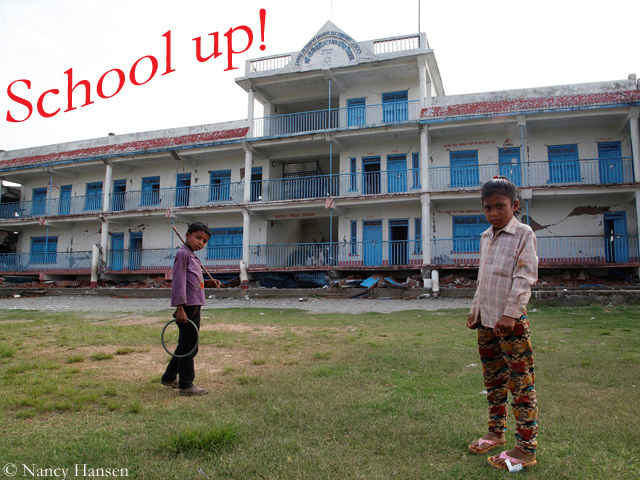 Update 28. March: The die is cast. 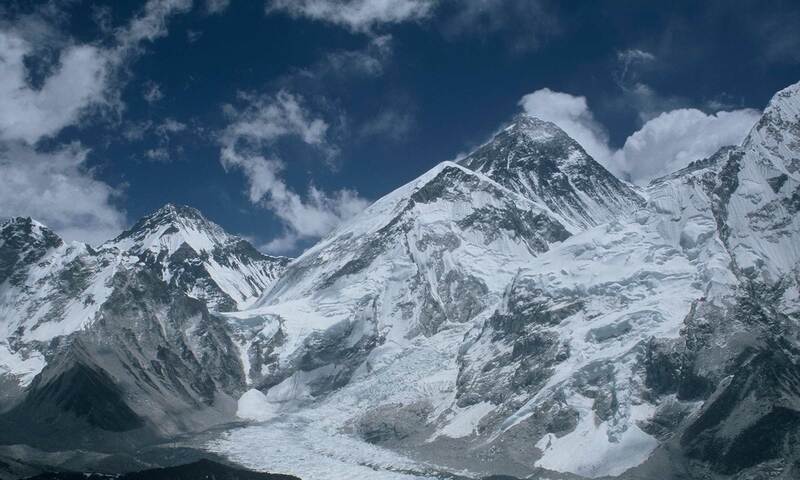 Dmitry Golovchenko and Sergey Nilov will descend via the Southeast Ridge. The weather is getting worse again. Next PostNext New routes on Annapurna, Dhaulagiri and Everest?